You lose some, and you find some. That’s pretty much the name of the game when it comes to biodiversity, although these days the odds are stacked heavily towards the losses—even as millions of species are yet to be officially discovered and added to the scientific archives. But it can be heartening to remember that even during what many scientists are calling the sixth mass extinction, species are still coming out of the woodwork. Many of these plants and animals are downright cool, adapted to challenging environments such as the deep sea, which has allowed them to remain hidden from our eyes—and, to a lesser degree, from our industrial activity and climate change—for so long. Here’s a quick roundup of some of the species that were added this year to the two million that’ve already been discovered. It’s been a tough year on the environment front, and we could all use a little additional life. Lanternsharks light up the deep sea with an otherworldly glow. This year, scientists added a new species of lanternshark, Etmopterus lailae—a foot-long and not very attractive creature found off the northwestern Hawaiian islands—to the strange array of existing varieties, including ninja lanternsharks, dwarf lantersharks, and blackbelly lanternsharks. Glow-in-the-dark markings line the new shark’s snout and head, and distinctive marks on its sides set it apart from other species. Now it just needs a snazzier name. Three new toad species—the Dixie Valley toad, Railroad Valley toad, and Hot Creek toad—were discovered in Nevada’s Great Basin this year, as part of a survey of an ancient lake bottom. Discoveries of new amphibians in the U.S. soil are extremely rare: the last toad species to be discovered in America was the now-extinct Wyoming toad, in 1968. Amphibians are some of the most threatened animals on the planet, thanks to habitat destruction and recent disease outbreaks. 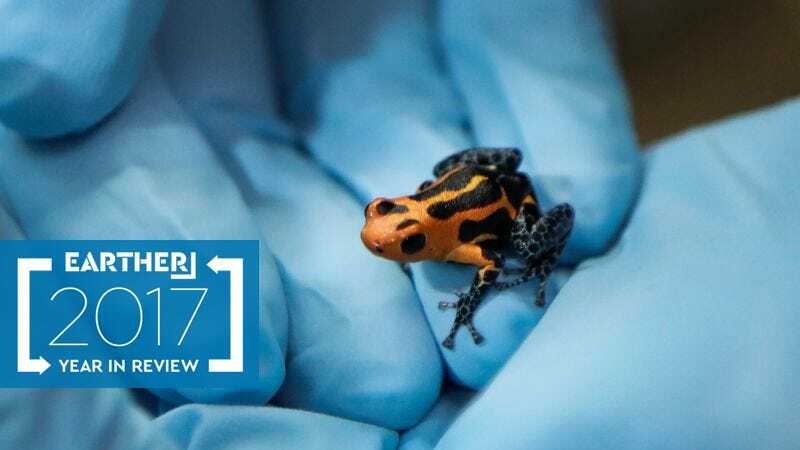 According to the ICUN, of the 6,260 amphibian species assessed, nearly one-third, or some 2,000 species, are globally threatened or extinct. So, perhaps the Nevada toads have the right idea in seeking out survival in some of the most remote and hidden amphibian habitats around. The vika (Uromys vika) is four times the size of even the heftiest city rat. Found on the Solomon Islands, the scaly-tailed critter can weigh more than a pineapple. Locals knew about the rat for a long time, but it was just named by western scientists this year—the Solomon Islands’ first newly named rodent in 80 years. Not all species that are being discovered these days still exist. Many have gone the way of the dinosaurs. Such is the case with an ancestral penguin species whose fossilized remains were recently found in New Zealand. The long-extinct penguin was immense. Standing nearly six feet tall and weighing more than two hundred pounds, it was one of the largest semi-aquatic birds ever to shuffle across the Earth. Named Kumimanu biceae, “kumi” after a fearsome monster in Maori mythology, and “manu,” a Maori term for bird, the penguin lived between 60 and 55 million years ago. Many species are only slight variations on each other, having branched off the evolutionarily tree in the recent past, or remained similar over time. Such is the case with a newly-discovered fourth species of ocean sunfish, the Mola tecta, or “hoodwinker mola”. Known as the world’s largest bony fish, for the last 125 years only three species of mola had been confirmed. But after an extensive analysis of more than 150 samples of DNA, researchers found one type that didn’t neatly fit with the three previously recognized species. After identifying it as the hoodwinker, researchers have found it off the coast of Australia, New Zealand, southern Chile, and more. Hold onto your sea hats—it turns out the the largest known octopus on Earth, the giant Pacific octopus, is actually two species. Similar to the case with the mola, scientists thought for decades that giant Pacific octopus might be an “umbrella name” covering more than one species. Now, they are sure. At the moment, the newly discovered species is being called the “frilled giant octopus” as it awaits a Latin name. Much about the octopus remains a mystery, but it’s enough for now to know another variety of these remarkable creatures is navigating the oceans. As far as I’m concerned, the more species of octopus the better. Then there’s also the physical resemblance, of course.